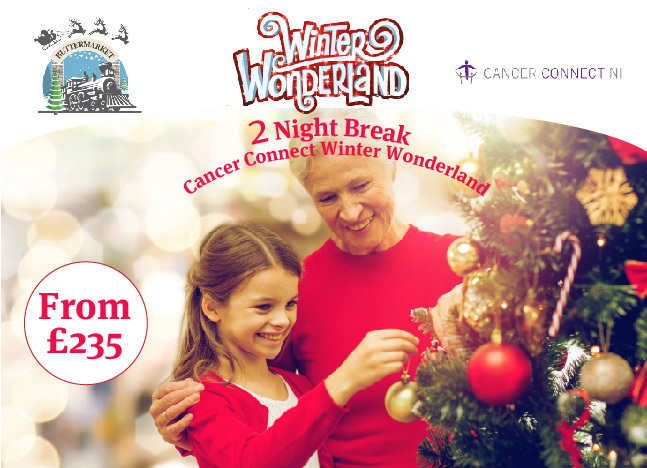 This 2 night break at Belle Isle includes a visit to Santa at the Cancer Connect Winter Wonderland in Enniskillen. Available from 28th November to 9th December 2018. Families will begin their experience at the railway station located at Hollyhill (adjacent to Lidl). Once checked in at the ticket booth, you will be greeted by Mrs Claus and her elves who will treat everyone to complimentary mulled wine, hot chocolate, mince pies and cookies. Following some games and fun entertainment you will be invited to board our NEW Polar Express and travel through the beautiful town of Enniskillen, discovering the festive windows along the route and ending at Santas Grotto at the Buttermarket. Santa will have a special gift for each child and a photographer will be on site in Santa’s grotto to capture the moment. Details, samples and prices will be available at the grotto. The Enniskillen Christmas market will be open to the public in The Buttermarket. Following a visit with Santa you are welcome to browse through the market and have a ride on the carousel or enjoy a stroll through the town centre and enjoy the festive atmosphere. Families can avail of an “open return ticket” on the Polar Express returning to your parking area at the railway station at your leisure.